Creates desktop picture from random cover art in iTunes. Is there a better alternative to Coverlover? Is Coverlover really the best app in AppleScript category? 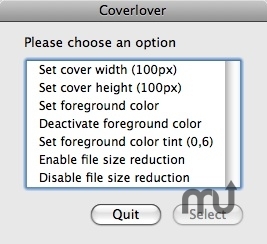 Will Coverlover work good on macOS 10.13.4? Coverlover is an AppleScript that creates and sets a customizable PDF wallpaper made of random iTunes cover art. You can change the cover art size, add a foreground color with a certain tint to improve the desktop appearance and also choose file size reduction. The AppleScript runs significantly faster on Intel Macs. Coverlover needs a review. Be the first to review this app and get the discussion started! Coverlover needs a rating. Be the first to rate this app and get the discussion started!